WELCOME TO NUFAR NATURAL WEBSITE! NUFAR Natural Products was established in 1995 as a company involved in the development, producing and marketing of natural products to pharmacies, health food shops and naturopaths. 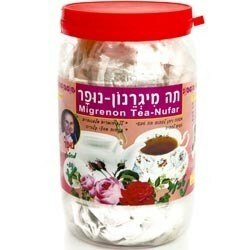 A new Israeli development for the treatment of migraine – "Migranon Tea"
manufactured by the Israeli company, "Nufar"
"Migranon Tea" is based on the special properties of the Ginko plant. Migranon Tea improves the flow of blood to the brain and assists in enriching the brain with the oxygen and glucose it requires. In this way it assists in preventing migraines, headaches, dizziness, fatigue, loss of memory and difficulties in concentrating. Migranon Tea contains: Ginko biloba, Achillea, Melissa Officinalis, Crataegus, Rosemary Officinalis, Vitex agnus castus, Passiflora, Verbena Officinalis, Micromeria fruticosa, Mint and Salvia. The Ginko tree is the most ancient tree in the world and has existed for about 200 million years without any change whatsoever. The Ginko tree originated in China and can live about 1,000 years. It is considered to be the most important medicinal herb of the twenty first century owing to its ability to improve the quality of life of those who take it, primarily as it can improve and renew the abilities of the brain. The Ginko plant helps in treating Arteriosclerosis and in this way ginko improves the flow of blood to the brain which nourishes it with the glucose and oxygen it requires. Thus, it prevents such symptoms as: migraines, headaches, dizziness, fatigue, loss of memory and difficulties in concentrating. Furthermore, Ginko acts like a natural anti-oxidant and protects the red blood cells from toxins known as free radicals. Ginko strengthens blood vessels and prevents the breakage and permeability of blood capillaries. Medicinal Rosemary Officinalis is effective in treating headaches, primarily those caused by low blood pressure. Rosemary Officinalis improves blood flow and thus helps to prevent migraines and headaches. It prevents the formation of clots in blood vessels. Rosemary Officinalis relieves pain thanks to the flavonoids it contains. In addition, these flavonoids also reduce the permeability of blood capillaries and lessen their fragility. The Crataegus herb relieves pain, strengthens the heart, reduces high blood pressure and balances it, relaxes, prevents cramps, regulates the heartbeat and extends the resting phase between one heart contraction and the next. Crataegus prevents the oxidation of fats in the blood and in this way prevents arteriosclerosis and permits a better flow of blood to all parts of the body including the brain. Verbena Officinalis relieves pain, relieves and stops cramps, can also help you relax at times of irritability and helps to prevent anxiety and depression which are sometimes causes of migraines. To summarize: The unique mixture of herbs found in this natural herbal tea, "Migranon", helps in treating migraines and headaches, in preventing dizziness, fatigue, loss of memory and concentration. Instructions for use: 2-3 cups daily. 100% natural ingredients, without caffeine, without edible coloring or preservatives.